Since the globalization of clinical trial activities from mid-1990s, there has been a strong demand by investigators and clinical research personnel in those emerging clinical trial regions, such as Asia, East Europe, Middle East, Africa and South America, for professional training based on international clinical trial standards. 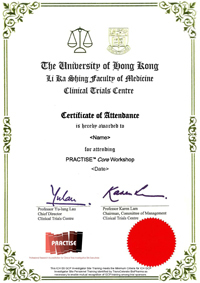 To promote the core principles of subject protection, science and data integrity and to facilitate implementation of such principles at study sites, HKU-CTC has developed a unique training program called PRACTISE® (Professional Research Accreditation for Clinical Trials Investigative Site Executives). PRACTISE® is a comprehensive training program specifically designed for addressing the needs of clinical investigators, study coordinators and other study site personnel. The program includes 25 modules covering three key areas including (a) clinical trial concepts and compliance; (b) clinical trial preparation; and (c) clinical trial process. Each module can be supplemented by practical sessions comprising case studies, group discussions and quizzes. All PRACTISE® trainers are senior study site management professionals with hands-on experience in clinical trial management and operations. PRACTISE® Core is the essence of the PRACTISE® program covering the core areas that investigators and study site personnel must know about. The program is composed of eight out of the 25 modules, adding up to a total of only five lecture hours. PRACTISE® Core meets the minimum criteria for ICH GCP investigator site personnel training identified by TransCelerate BioPharma (a non-profit organization established by a number of international pharmaceutical companies targeting for harmonization of requirements and practices in pharmaceutical research and development) as necessary to enable mutual recognition of GCP training among trial sponsors. Each participant successfully completed a PRACTISE® Core workshop will be issued a certificate acceptable to TransCelerate’s member companies. 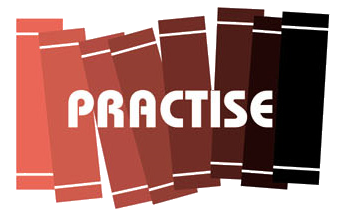 Over the past few years, the PRACTISE® program or its individual modules have been delivered to various study sites, research institutions, hospitals and governmental organizations in Asia, Middle East and North Africa regions such as Hong Kong, Macau, Taiwan, mainland China, Malaysia, Vietnam, UAE and Egypt. It is regarded as a very effective training platform meeting the latest requirements in the rapidly changing international clinical trial environment. Its unique perspectives and insights have also gained very positive feedback and acknowledgement from workshop participants. Point at the locations for more information.